Field Touring Alpine Blog: FTA Satopanth - C1 Established! Ben has left an audio dispatch (see below) which unfortunately is a little garbled in spots due to the bad connection with the Thuraya satellites and we'll have him put up another tomorrow and hope it connects better! Fortunately Ben also called into the office and over two phone calls we were able to catch up on all the news from Satopanth! At this time Nicole and Scott are up for the night at C1 and enjoying some pretty good views from up there! All of the FTA ropes and tents and stove and gear has been taken up to C1 and tomorrow Ben, Gavin and the HAP's hope to get their first night in C1 as well. Yesterday the entire crew took a good walk up to C1 and made the main load carry. Ben says it is just a 3 hour cruise and gains about 200 vertical meters. Above C1 the real climbing starts and at this time there are a few other teams above that have been pushing the route through to near C2 so hopefully when our turn comes we'll have some of the route set and we can finish off any pieces needing more attention. Tomorrow when Ben is up in C1 he'll have a good check in with the other teams on the hill and we'll begin to formulate a good plan. As long as the weather holds there is a good chance our team will not return to base camp until they are done with the attempt! Nicole and Scott are a very experienced pair and will be moving as strongly as they can on the hill and likely ahead of Ben, Gavin and even the HAP's! Gavin is nursing a flare up in an old ankle injury so there may be an extra rest day or two built into the schedule and we'll hope it does not slow him down too much! We'll have more news in the days ahead of the progress so check in often! 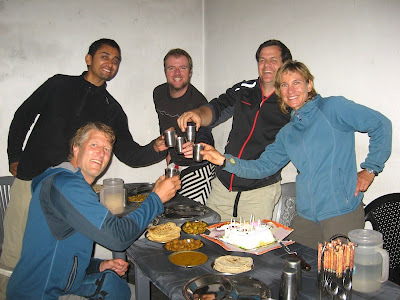 Birthday's on expedition are quite special and I am sure Nicole will not forget this particular one in Gangotri with Satopanth awaiting her just around the bend! I have been lucky enough to celebrate a few in Nepal and can see each one quite clearly (including three on FTA Ama Dablam expeditions with cakes made by our famous disco-chef Ratna Man Gurung!) Ben has now had a few in Pakistan under the flanks of Broad Peak and K2 - not a bad spot either! We would all recommend that you look for a great expedition during a birthday and enjoy impromptu cake in a remote environment! Let us know if one of our trips fit and what kind of cake you like! Satopanth had an early attempt by a German group in 1938 during the period of when German and Austrian expeditions were in full swing and included the first ascent of the Eiger's Nordwand by a group including Heinrich Harrer (Seven Years in Tibet ). 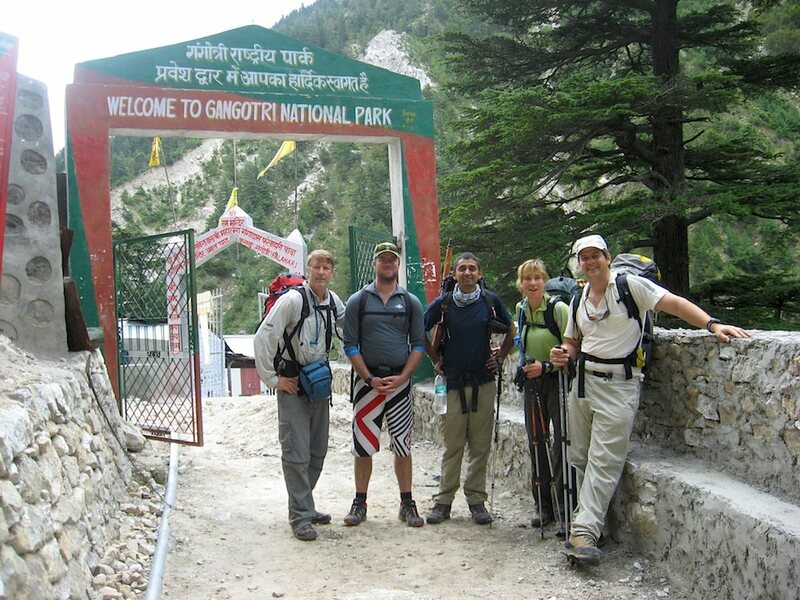 The German team reached 20,000ft but were barred by the rocky ridge and the fact that they had only 2 climbers. 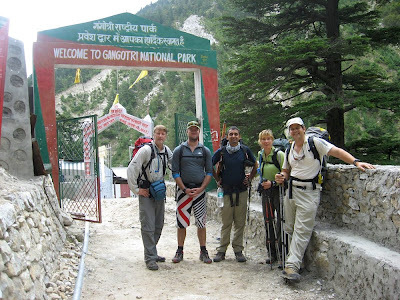 The exploration and climbs that they dod accomplish on their trip make a great read! In 1966 there was another attempt by a team consisted largely of a group of "Calcutta" climbers as they called themselves and had a supporting cast of Sherpas (including Everest summiteer Karma). They began too late in the season and ran into winter conditions and the climb was abandoned in mid Octoberr. 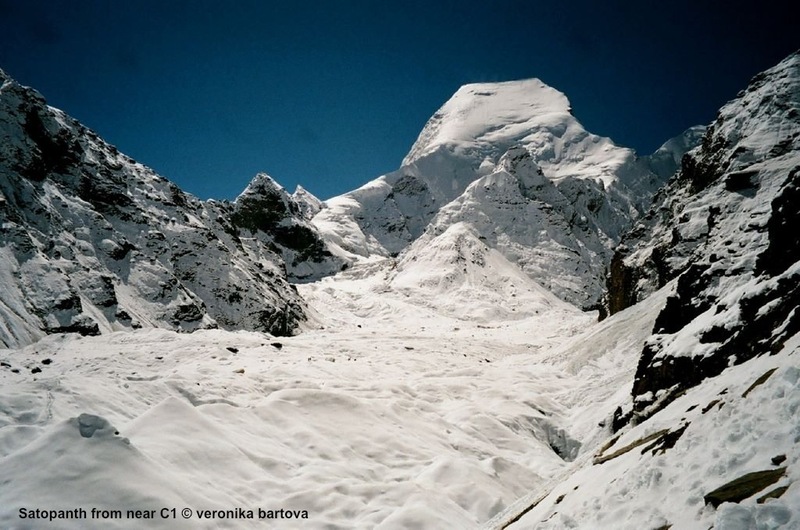 The team moved on from Satopanth to climb nearby Bhagirathi II with four members reaching the top on Oct 20. 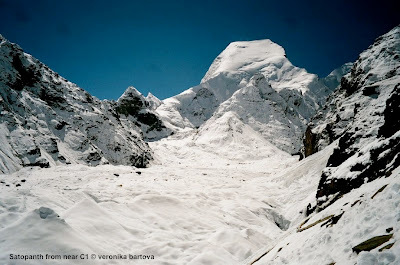 During the descent there was a tragic fall and in the end three of the summiteers succumbed to injuries on the mountain. The full report can bea read below and is quite heartbreaking. The peak was finally climbed by a Swiss team in 1947 and then it was another 33 years til it ewas climbed again! A report from a team in 1998 has quite a good history of many of the climbs and is a worthwhile read for anyone wanting to know more about the history of the area. As this is our second expedition to Satopanth we are interested in expending our offerings in the region and Shivling and Kamet loom large. If you are interested in joining us in 2012 or 2013 let us know!